Happy Evolution! I love to cook and feed my children healthy meals, but I don't have all day to spend in the kitchen. I always have Brown Basmati Rice in my pantry. It so easy to cook up and easy to use in so many dishes. 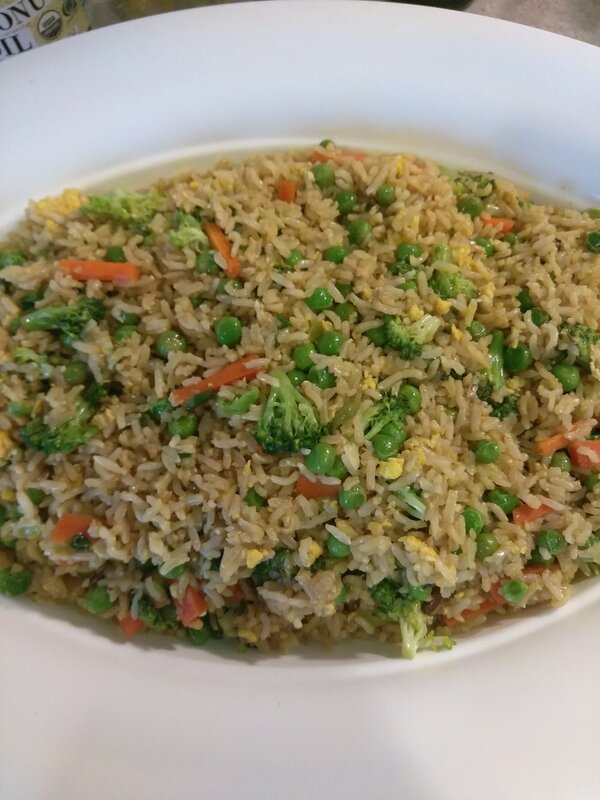 One of my go-to recipes for a quick and easy lunch or dinner is my Veggie "Fried" Rice. I love making this because its a great way to get some veggies into the bellies of your picky eaters, yet tasty, filling and satisfying for everyone else! Heat 2TB coconut oil in a large sauce pan. Rinse rice and let it drain. Then add it to the pan, stirring frequently for about a minute. Then add 4 cups of water and bring to a boil. Once boiling, reduce the heat and cook covered about 20 - 25 minutes, (Cooking times vary according to your stove and the rice). Once cooked, remove from heat and let it cool. Crack 2 eggs into a hot saute pan and scramble. Cook through and add it to the cooled rice. Sprinkle in the Turmeric until you get the color and flavor you want. Add eggs to cooked rice. Chop, slice and dice all of the vegetables. Heat 1 Tsp of Coconut oil in a large saute pan over medium high heat. Once pan is hot, add the veggies and saute 2-3 minutes, until the peas and broccoli turn a bright green color. Reduce the heat and add in the chopped garlic. Stir to blend all together, then add in 1 TB of Sesame oil. Stir and cook for another minute. Check for taste and add up to 2 TB of Liquid Aminos, 1 TB at a time- taste before you add more. You want to be able to still taste the veggies and sesame oil. Saute the veggies until crisp. Do not overcook. 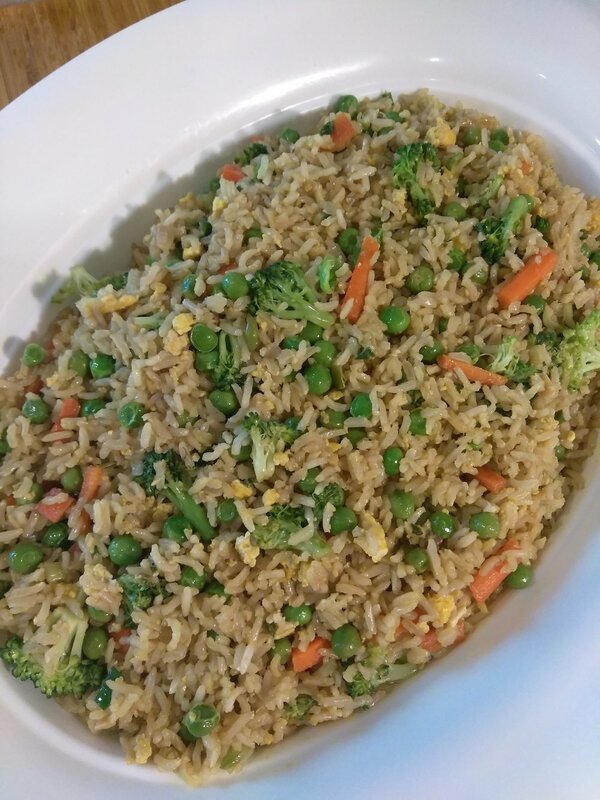 Once the veggies are cooked through (but still crisp), add them to the rice and egg mixture. Stir to combine and add 1 TB of Coconut Aminos and Sesame oil at a time. Add more or less to taste depending on the flavor profile you are looking for. Once mixed together, top with leftover scallions and Enjoy!